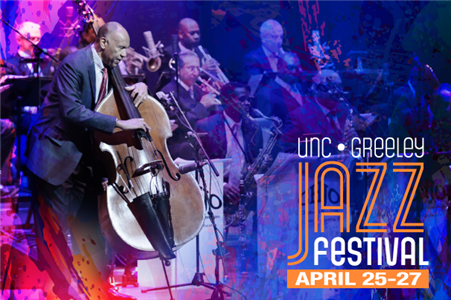 The largest event of its kind in the nation, the UNC/Greeley Jazz Festival brings together internationally recognized artists, jazz lovers, award-winning clinicians, and over 250 college, high school, and middle school big bands, combos, and vocal jazz groups. Each year, over 7,500 participants enjoy the main stage concerts, after-hours sessions, daytime performances, and the many educational workshop sessions. The Festival is a non-competitive educational and cultural facet of the UNC Jazz Studies Program that furthers the University of Northern Colorado’s mission of lifelong learning and commitment to service. The 2019 UNC/Greeley Jazz Festival, now celebrating its 49th year, will welcome elementary school, middle school, high school, and college jazz ensembles from throughout the United States. In 2018, participating schools traveled from Thailand, Washington, Texas, Maryland, Nevada, Iowa, Arizona, Kansas, New Mexico, North Dakota, Nebraska, Colorado, Oklahoma, South Dakota, and Wyoming. Open to all levels from elementary school through college/university and semi-professional groups, the festival hosts a wide array of ensembles in a non-competitive environment. Groups may register in four categories: big bands, combos, vocal jazz groups, and vocal soloists. All groups receive recorded comments and a feedback clinic from some of our 40 artist/clinicians (college big bands receive recorded comments only). Each day, several educational workshops on topics ranging from improvisation and arranging to vocal and instrumental techniques are offered by the artist/clinicians and our main stage artists.